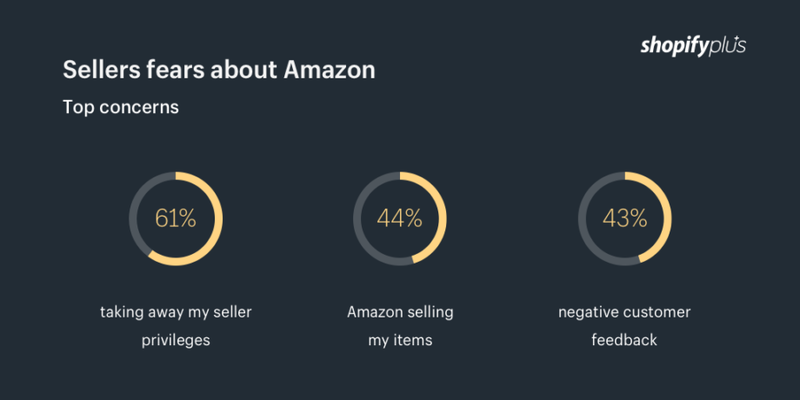 A breakdown of the top e-commerce strategy of 2019. If last year is any indication, then 2018 is going to be another record-breaking holiday eCommerce season. 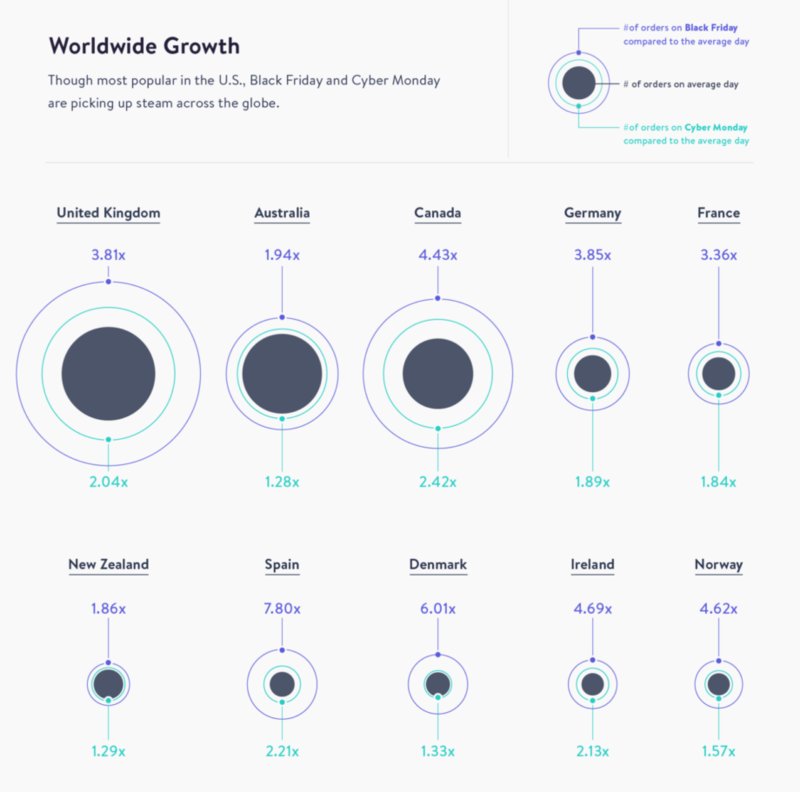 Black Friday eCommerce alone is projected to increase by 15.31% year-over-year to $5.80 Billion in the U.S. with mobile sales expected to grow to $2.44 Billion. With that in mind, we’ve identified a number of things you should probably be thinking about in the run up to Cyber Monday. Your goal during the holiday season is to remove every obstacle that would be in the way of turning a visitor into a buyer. One of those hurdles is a slow website. A website with a laggy load time slows down the purchasing process and increases the chance that visitors will leave your website before purchasing. In fact, a slow load time is directly related to a higher bounce rate. To avoid that demise, speed up your website before the holidays. The first way to do this is by optimising your images. Load times suffer when images don’t fit the screen that’s summoning them, or there are simply too many images on a single page. Mobile load times suffer most drastically because mobile devices don’t have the processing power of desktop computers. 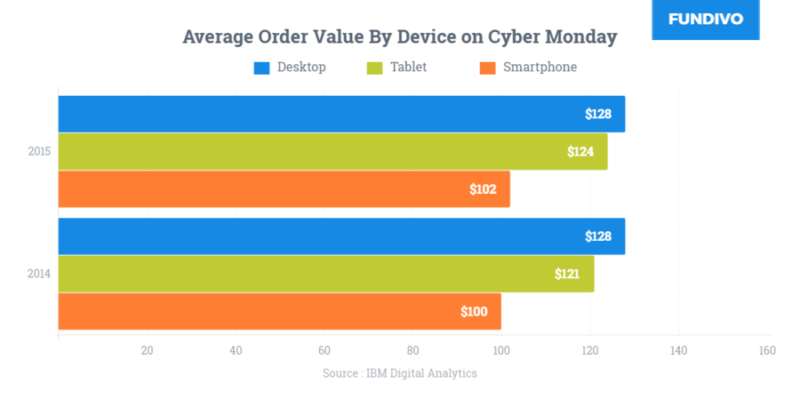 As motivation to optimise your images, consider how much business comes through smartphones during Cyber Monday. That’s a lot of business you don’t want to miss. 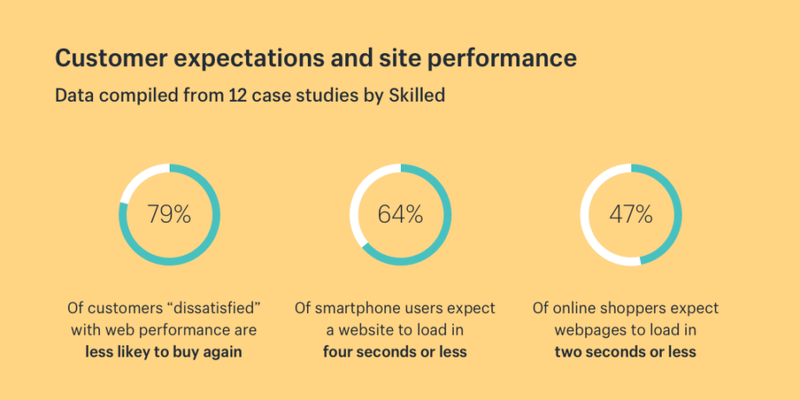 When optimising your website's load time, just remember this: anything that your website needs to generate when a visitor arrives — images, unorganised CSS and HTML, and even an overabundance of white space — will slow your website down. It might be by milliseconds, but that is time you can’t afford to lose. 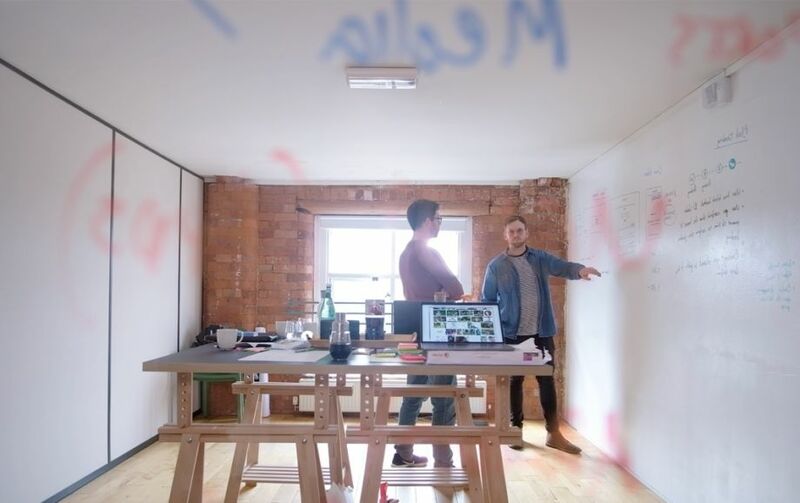 To discuss continual improvement of your eCommerce site speed and performance, book a workshop with one of our engineers and they can give you an idea of what's involved. Before the holiday season, you’ll want to make sure all of the tools that can work in your favor, are working in your favor. Intercom - Offers live chat that might free up call centre bloat at busy times. Drift - a free version of the above. HotJar - Offers remote screen recordings and heatmaps to highlight commonly used areas of your product as well as diagnosing any user flow issues. Zendesk - Simplifies your customer support tickets. It’s a great strategy because, according to a benchmark report by Klaviyo, highly segmented emails that go out to VIPs — that can be just 3-5% of your overall list — will way outperform the rest of the customers in your database. 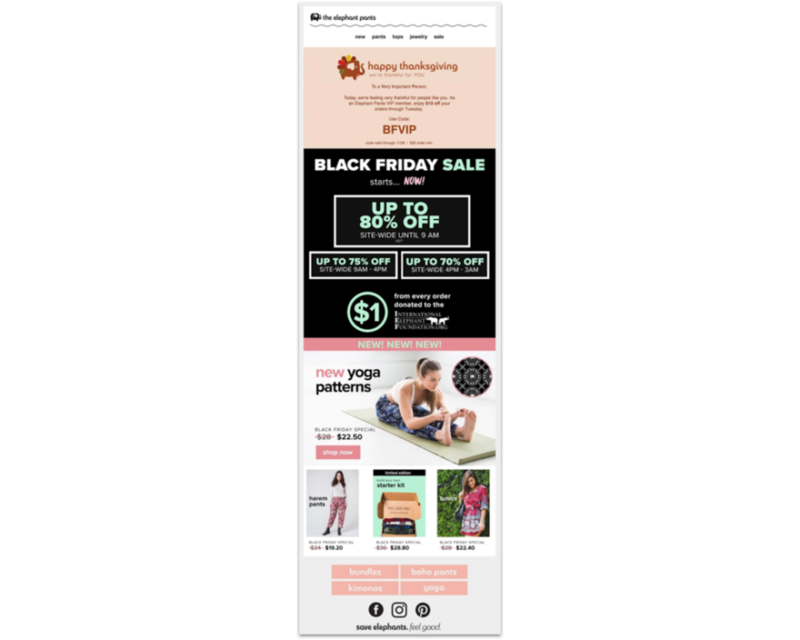 Email is still a staple of Black Friday Cyber Monday sales generation, so you must be strategic about when to send your promotional emails and to whom. For the Recent Openers, Browsers, Ignorers, Hasn’t Purchased or Almost Purchased segments, it’s vital that you offer them incentives to complete a purchase … or at least to open your damn email. Of course, each of the offers and messages should be tailored to the segment. 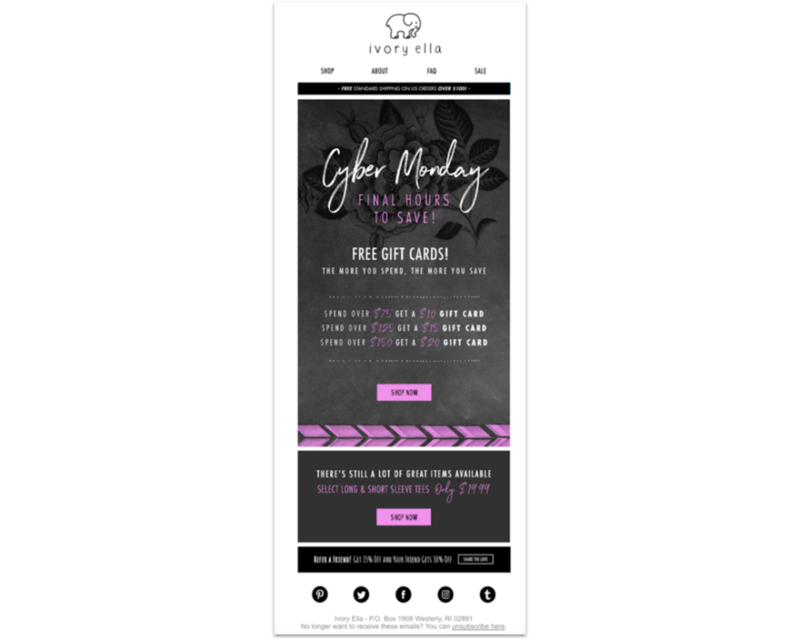 For the Almost Purchasers segment, Ivory Ella sent an email out to only those customers who had received their morning email but had not opened it or placed an order that day. For Email Ignorers, try offering them free shipping or a complimentary gift with purchase. Ursa Major of VT sent the offer below at 7 pm the day after Black Friday to subscribers who did not open an email on the day of the sale. Of all the activities people use their phones for last year, mobile shopping was the fastest growing segment — up 54% YOY. The story was a little different elsewhere, with desktop sales accounting for 44% of all traffic but still commanding 61% of sales during the 2017 holiday shopping season, according to Adobe Digital Insights. By detecting a user’s mobile device, your offer can dynamically adapt to reflect the value of items in a customer’s cart relative to the free-shipping threshold. For example, if the first message displays “FREE SHIPPING to GLASGOW with a £50 purchase” and a user adds a £25 product to their cart, it’ll change to “YOU’RE £25 AWAY FROM FREE SHIPPING” to encourage users to buy more. 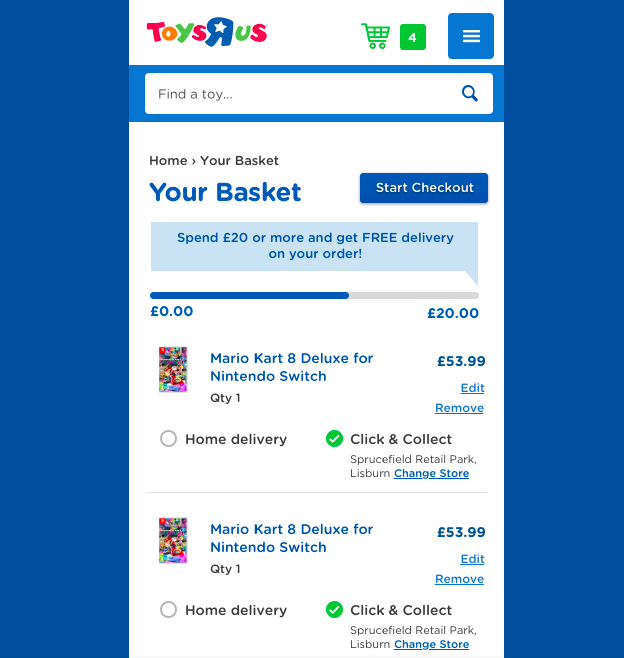 In Dawson Andrews work with Toys"R"Us we identified through A/B testing that the progress bar was a key element towards increasing cart value by offering free delivery after a certain threshold. Previously just a homepage advert it provided an ongoing reassurance that if they did spend more than £20 the discount was likely to appear in their cart. Blue Boost's Black Friday 2016 data revealed that iOS users for a large outdoor merchant’s site spent about $110 on average while Android shoppers had an AOV of around $85. Using device targeting, they used a page curl notification to display a 20% off coupon for orders larger than $100 for Android users while that same 20% off promotion could be applied to more expensive items for iOS users. Small details can have a huge impact. Case in point, Print Globe increased its conversions by 18.5% by optimising the navigation design for its website. B2B branded apparel and accessories provider, Merchology, needed to quickly re-design its eCommerce site to offer a mobile-first customer experience that would make checking out on a mobile device easier. UIE’s report revealed that impulse purchases account for ~40% of all the money spent on ecommerce. To boost impulse purchases, you should reduce the effort required for a user to buy something on your site. 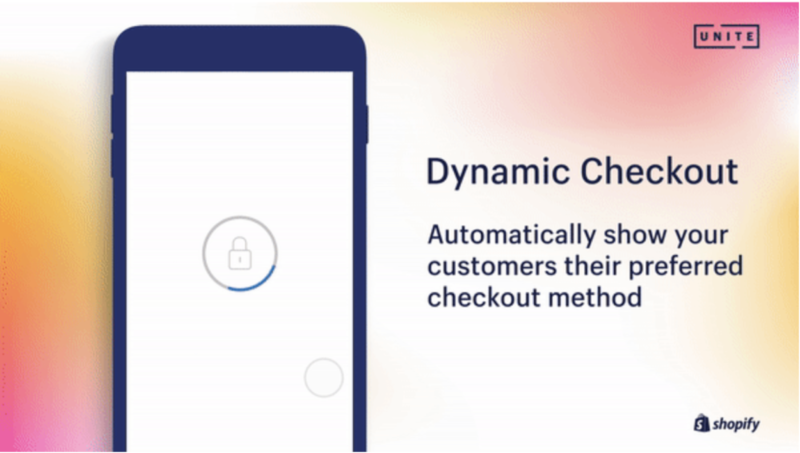 Shopify have nailed this with their Dynamic Checkout feature. It allows you to also add dynamic checkout buttons to increase mobile transactions. Once a customer has selected their preferred payment method — ApplePay, PayPal, or Amazon Pay — Shopify’s backend remembers their choice and automatically presents their choice on all future visits. As mobile commerce continues to grow, businesses need to provide an integrated and seamless experience across all consumer touchpoints that makes multi-channel selling as natural as possible. Also, providing a seamless brand experience and consistent fulfilment processes for all orders should be top of mind. In 2015, Facebook went beyond ads and allowed merchants to create and run native shops. Then, Pinterest added native functionality with Buyable Pins. Bots and Messenger integrations weren’t far behind. Last year, Instagram joined the party by launching Shopping on Instagram. ORO Los Angeles seized this opportunity early and quickly achieved a 29.3% lift in month-over-month revenue directly attributable to Instagram. Enabling customers to claim loyalty rewards directly from their cart with one click can also help grow AOVs, while seamlessly integrating with the natural user journey. Shopping cart abandonment is still high in online retail – at roughly 76% worldwide according to Statista. Email marketing has long been an important tool used by eCommerce merchants to rescue abandoned carts. If a Pura Vida customer views a product on the website but doesn’t buy right away, Pura Vida can automatically send this customer a message on Messenger to offer a discount using ShopMessage. It takes one click for customers to return to the checkout and see their cart reconstructed, with an automatically applied discount. Pura Vida also uses Retention Rocket to rescue abandoned carts and automate marketing through SMS – sending an average of 987 messages a day with a conversion rate of 14.6%. TRU's catalog of 400,000 SKU's has unique attributes such as type, age bracket, and brand; some products need to be listed under multiple names and descriptions. As a result, on-site search used to be a major challenge. 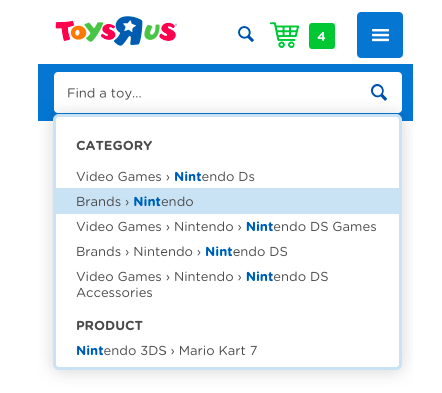 Using a Bloomreach Search integration we were able to catalogue the Toys "R" Us SKU's in a seamless way that would react to the customer's line of enquiry rather than demand them down a certain route. TRU's investment in Search had a huge impact over the 2017 holiday season seeing overall conversion rate grow over 20%. According to Dropoff’s 2018 Holiday Survey, “three out of four (77 percent) consumers plan to do last-minute shopping, which is a 15 percent increase compared to the 2017 results.” To capitalise on this opportunity, eCommerce merchants need to have a solid last-minute shipping plan. The term Green Monday was originally coined by eBay in 2007 – referring to the Monday that is at least ten days before Christmas. Consumers are in full swing of the holiday shopping season on this day which means it’s a great day to beef up your marketing efforts. During Free Shipping Day, participating eCommerce stores offer free shipping on their items and guarantee delivery by Christmas Eve. Impulse purchases are far too common during the frenzy of Black Friday Cyber Monday deals...so are the cancellation and return requests. Don’t punish customers for returning items with a complicated return policy or poor experience. That’s why it’s crucial to properly display a clear return policy to earn your customers’ (who may have been burned in the past) trust. It’s also essential to make the returns process as simple as possible to save you and your customers time and money. These simple, yet important services are table stakes to compete with the likes of Amazon. Black Friday / Cyber Monday are creations of the advertising industry, in a lot of cases brands are over-discounting and underselling the brand they have been building all year. Make sure all efforts on eCommerce align with your broader business goals. Use this heightened traffic to engage new customers that will buy year round, it will be a fraction of the real traffic but it is an increase none the less. Use this opportunity to build your customer base for 2019 sales and not just cash in before we all collapse beneath the Christmas tree. 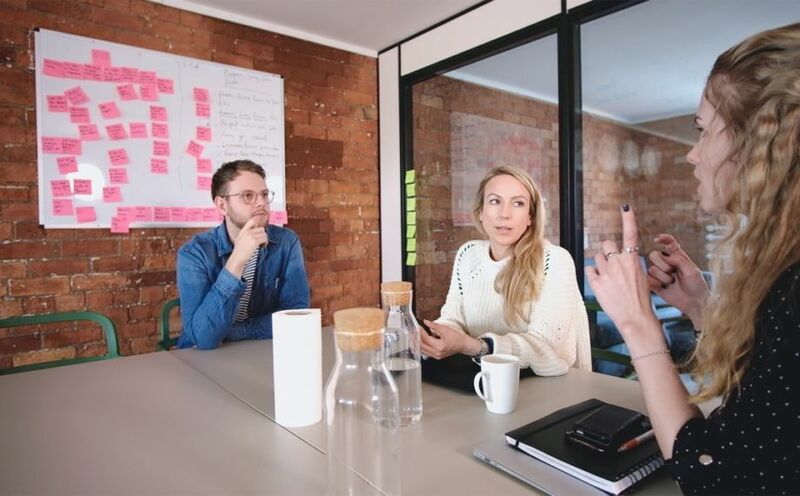 We run great workshops where we dive into your business goals and look for ways digital can help you achieve those. Book a slot for 2019 here.